Ever since I passed my CPA Board exams, I struggled to become independent and live with my own means.Â I bet all of us can relate or at least pay our own bills these days.Â If you want to know which of your appliances give your wallet much burden then you should head on to Meralcoâ€™s website! 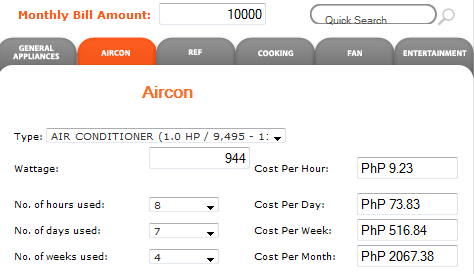 The Meralco Appliance Calculator (M.A.C.) has been a consumerâ€™s electricity budget buddy since 2003. The M.A.C. is designed to be an electricity bill management tool of Meralco residential customers to help them: a) better manage their electric consumption and their electric bill; b) make wiser decisions in buying home appliances, and; c) get home energy efficiency tips that are customized to their home electricity consumption. Although the M.A.C. has been around for many years now, new features and enhancements are constantly being introduced to enable it to cater to theÂ growing demands of electricity users. 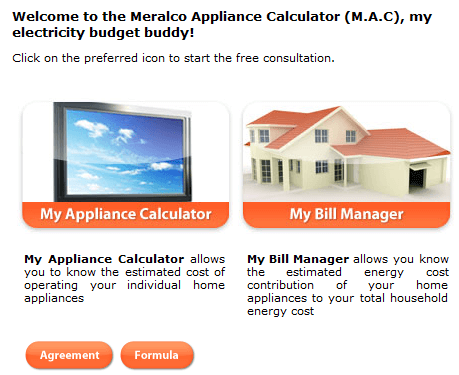 With the new Meralco Appliance Calculator (M.A.C), users can now have the option of using either â€œMy Appliance Calculatorâ€ or â€œMy Bill Managerâ€. â€œMy Appliance Calculatorâ€ allows the user to calculate the estimated consumption cost of appliances – one at a time. â€œMy Bill Managerâ€, on the other hand, allows the user to calculate the estimated consumption cost of appliances in a table format. It allows the user to get an estimate of the householdâ€™s total electric consumption cost and see which appliances consume more electricity. Other features of the â€œMy Bill Managerâ€ menu include: consumption manager, energy efficiency adviser and target bill amount estimator. Consumption manager allows the user to see the corresponding electric consumption pie chart and some text description of the chart based on the information provided by the user. The energy efficiency adviser, meanwhile, allows user to see some energy efficiency tips based on the information provided by the user. The target bill amount estimator, on the other hand, allows the user to see an estimate of his â€œmonthly target kWh consumptionâ€ and â€œestimated price per kWhâ€ by just inputting the â€œtarget electric bill amountâ€. Other new features of the M.A.C include: a) e-mailing of the M.A.C web link to friends through the â€œemailâ€ button; b) sharing the M.A.C web link to Facebook and Twitter accounts through the â€œshareâ€ button; c) sending feedback to Meralco regarding the new M.A.C through the â€œfeedbackâ€ button; d) printing the computation results of â€œMy Bill Managerâ€ through the â€œprintâ€ button (for easy access and future reference of the computations), and; e) viewing the basis for computing the estimated electricity consumption of home appliances for the M.A.C application through the â€œformulaâ€ button (so that users can validate the results of the computations). 1.Â Air Conditioner really significantly contributes to higher monthly bill.Â For example, using aircon 8 hours everyday in one month would equal to Php 2,067. 2.Â Use of microwave oven is not that expensive! For example, letâ€™s say we use microwave oven for 15 mins every day for the whole month (which is an overstated amount).Â It would only cost us P100 pesos that month. You can Check out for yourselves how your appliances perform and how you can use it more efficiently. The M.A.C. is truly a user-friendly, interactive and valuable tool for cost conscious electricity consumers. Go give it a try! With the MAC, our plan is to manage our household electricity costs within our budget.Â Since the topic is a little bit on the practical side, they also invited Beauty and Fashion speakers to talk about Fashion tips that helps fashion conscious people style themselves economically. Marie and Michi Calica graced the Meralco theatre with beauty and fashion tips that taught us how to get smarter with style. loving the MAC app. did a post about it some days back! hahaha! galing, it justified my use of my laptop. hehehe. ah airconditioning, it doubles our electric bill but what to do during summer months? I used to work graveyard shift and sleeping at noon is unbearable during summer. it is a great tool but I wonder if it considers the latest cost adjustments that Meralco has been making time and time again? i agree on the aircon’s electricity consumption – if you don’t watch it out, it might shoot rocket high. also, i don’t know how true is this but many advise to unplug any appliance that are not being used. they say it can help lower the elec. consumption too. how cool! hahaha. i hope more people get to use it. the smallest appliances cause the biggest surprises. haha. for us, it was the water dispenser. what’s the site. I think this is very important to me. i tried to google it pero the site ata is closed.